It’s been almost nine years since I sold my 1969 MGB, and at least eleven years since last being part of the MG Owners Club. But happily, now and then I hear from—or even see—old friends from the car club who have remained faithful to their British sports cars. Such as in June 2016. By coincidence I arrived in St. Louis to visit Maureen the same night Mike did. Thus, we arranged to have breakfast at Courtesy Diner, a 1950s restaurant a few miles from where Maureen lives, the morning after. In addition to Jennifer, Maureen, Mike and me, Mike’s friend Rick was present at breakfast. 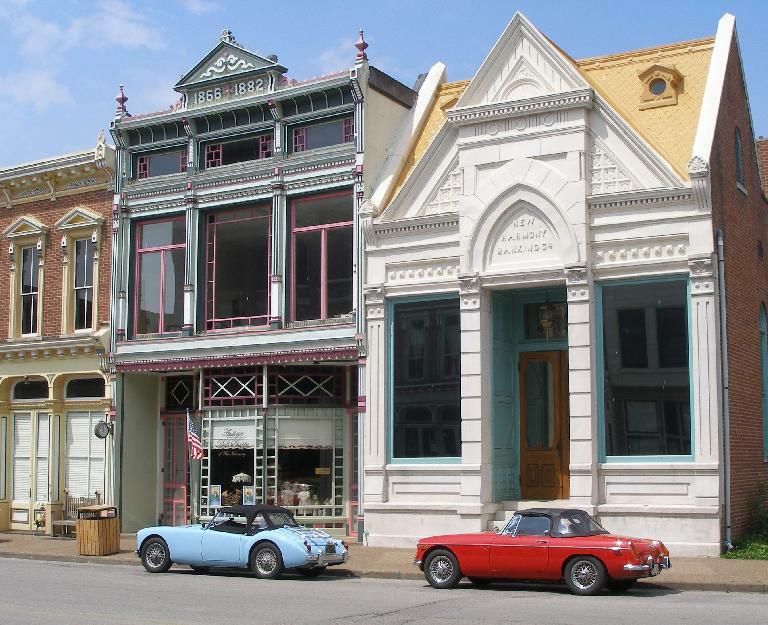 He drove over from his home in a St. Louis suburb in a red C6 Corvette convertible to visit with us. 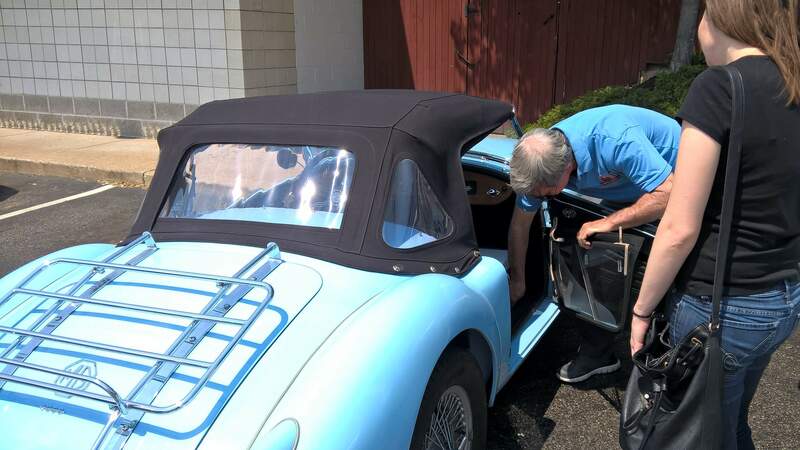 (“I’ve only owned red cars,” he said, “except for the blue MGB/GT that Mike now owns.”) Rick’s wife came too but drove separately. Mike and Jennifer’s road trip to and from Louisville turned out to be quite an adventure, which is pretty much a given for any vintage British sports car. Here are some excerpts from Mike’s emails about the trip. Right now, six blocks sounds like a wonderful tour distance. Yep, I took the A. I’m sooo glad it has the 5-speed [transplanted from a Merkur] now. We’re in Laramie tonight. I think today was 500 miles. I forgot to look at the odometer when I got out. We had one rain storm, but we could see it way off, so I got the curtains on in time. Note that MGAs had plastic and canvas side curtains instead of glass roll-up windows, and the convertible top had to be snapped on by hand. It was a far cry from being able to raise the top with the flick of the wrist or the press of the button, unlike convertibles today. Jennifer’s OD [overdrive unit] started cutting out yesterday and this morning I discovered there’s not enough oil in it to even register on the dipstick. We’re looking for a parts store now, so we can go buy a funnel to fill the gearbox. We filled the gearbox back up and it works fine again. We’ve been checking the level regularly. We got here OK except for one detail – the ramp to the very last freeway we had to take in Louisville was closed! We wandered around for a bit until we found a way to get on that freeway, so it turned out OK. Then we arrived 15 minutes before a not-forecasted thunderstorm rolled through, so we didn’t have to drive in the torrential rain. That was lucky. My MGA got fifth in class at this show, plus the NAMGAR distance award. Jennifer registered for both NAMGAR & NAMGBR, so she got a distance award from each, plus fifth in class for her car. Today we went to the British Bash, the annual local all-British show, back at Waterfront Park in Louisville. Jennifer won first in class there, plus their first-ever distance award. We also both won a door prize. Tomorrow we leave New Albany (outside of Louisville) for the Kansas City area. It turned out they detoured around Kansas City. It sounded like the country’s heat wave was a problem, especially since neither car has air conditioning. We were going to try to reach Kansas City today, but we took a detour to New Harmony, Indiana this morning, and spent some time there. So we’re in Columbia tonight. We still don’t know which way we’ll be going—it does seem to be hot everywhere but at home. At this moment, going back on I-80 looks cooler, but that can change quickly. The cars are running OK, but we aren’t—too hot. We stop about every hour or two just to get out and walk around or sit in the shade at the rest areas. We’re in Grand Island, Nebraska now. We opted for the I-80 route. We just had our first mechanical of the return trip: the brake lights quit working on Jennifer’s MGB. It was the switch, but she had a new one in her box o’ stuff, so we changed it out in the motel parking lot. All better now! This last malady, by the way, reminds me of an old British car joke. “What are the three positions of a Lucas switch?” “Dim, Flicker, and Off.” Haha! We’re in Elko, Nevada now. Last night was Rawlins, Wyoming where the Internet was so bad we gave up on trying to read email. We were going to try for Winnemucca today, but rooms were hard to come by there. I added another pint to Jennifer’s transmission last night too. The Internet isn’t a lot better here than last night, but I’ll try some pictures. The high point (literally) of yesterday’s drive was the Abraham Lincoln Monument at Sherman Summit, just east of Laramie, WY. It’s almost 9,000 feet. There’s a nice memorial for the Lincoln Highway there. Today we stopped by the Bonneville Salt Flats. The news was that they’ll probably cancel Speed Week again this year, due to the poor condition of the salt. There’s a lot of people upset with the companies that mine the salt, for taking so much and ruining the Flats. And what are the companies doing about this? Well, on the way out two weeks ago, I took a picture of the Morton Salt facility nearby. When we went by today, the name and logo had been removed from the plant. I guess that’s one way to handle it – don’t let anyone know what your company is. The last leg of the drive was from Elko, Nevada back to San Francisco. We got back about 9:30ish and after unloading/unpacking, I slept until noon today. Earlier in the trip I had ideas about coming into California via either Tioga Pass (and into Yosemite) or Beckwourth Pass (and following the Feather River). But when the time came we were so anxious to get back that we opted for something easier, and cut over to US 50 at Fernley, NV and came back that way, through South Lake Tahoe & then Placerville into Sacramento. It was nicer than I-80 over Donner Pass. The cars ran well the whole time, so I can’t complain about that. Now I have to change oil, grease the suspension, and wash several states’ worth of bugs off. Maybe tomorrow. No, nothing on the car. 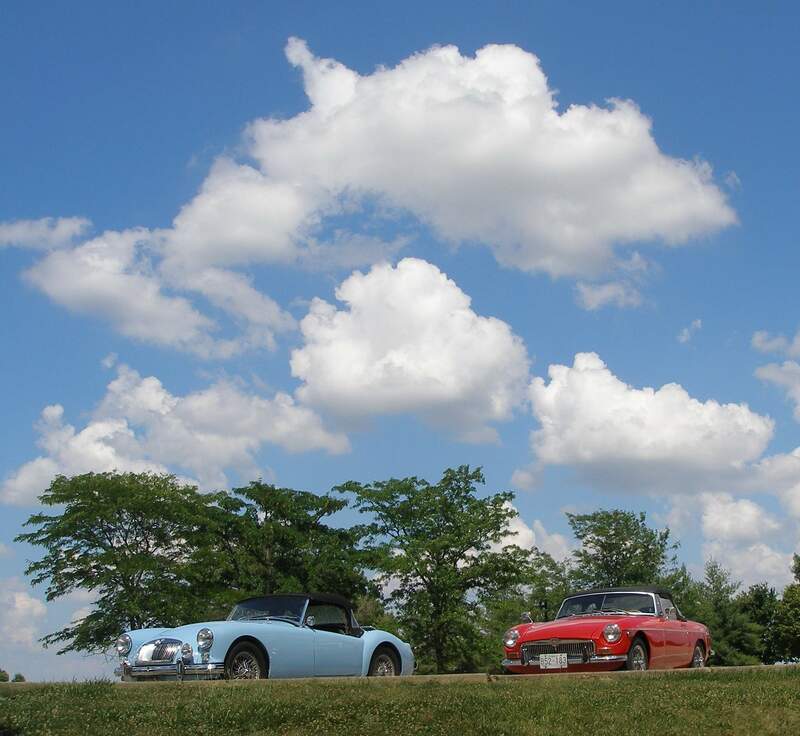 Tomorrow is the July MGOC meeting. 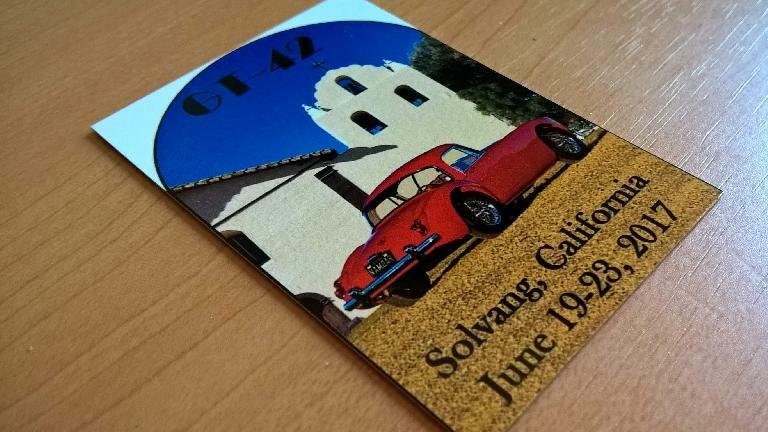 It’s in El Cerrito, so my plan is to drive the MGA over, and then stop at Treasure Isalnd on the way back for some pictures with the SF skyline in the background. Then it gets lubed and washed. Sounded like a great trip. 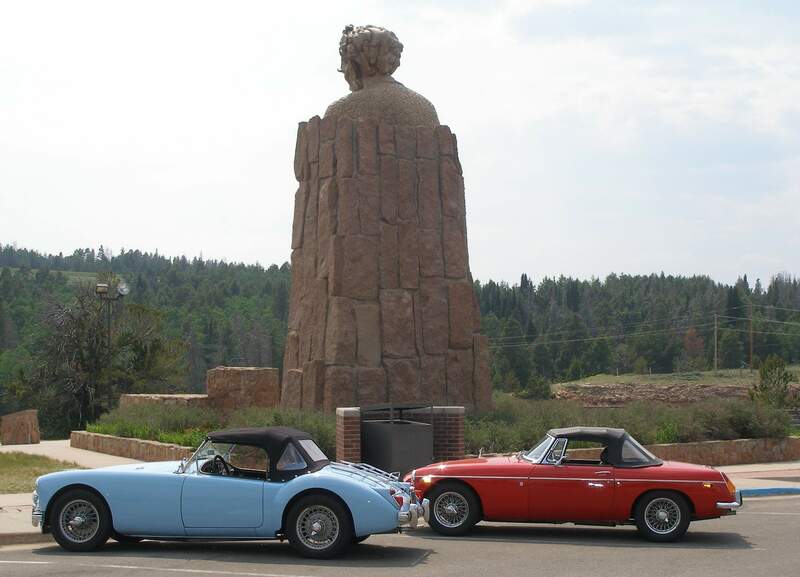 I miss these sort of road trips in a vintage British sports car (well, except for the mechanical problems and the lack of A/C), so through Mike’s excerpts above I am glad to be able to live vicariously. 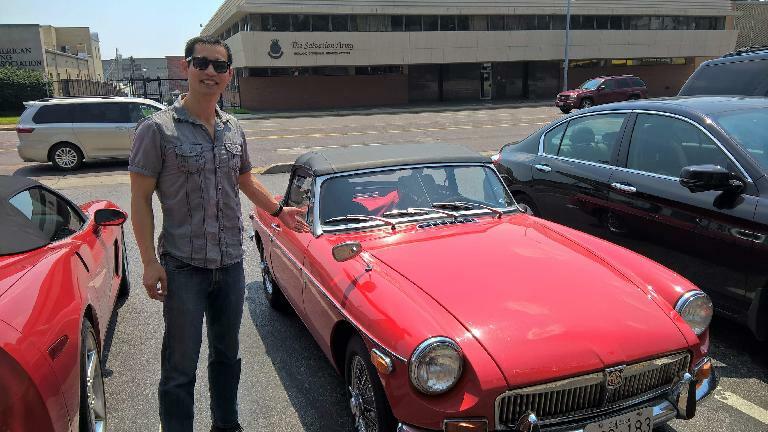 It turns out this was one of several long-distance journeys Jennifer has done in her MGB. Here’s a wonderful article about some of her others! Felix, you didn’t tell me Jennifer & I were soon to be famous and appear on your site! And don’t worry; the car is caught up on its maintenance now.